If you are looking for a hearty, delicious and easy camping recipe. You’ve found it. Pasta is an easy go-to dish for camping, but that doesn’t mean you have to resort to spaghetti and marinara sauce every time. 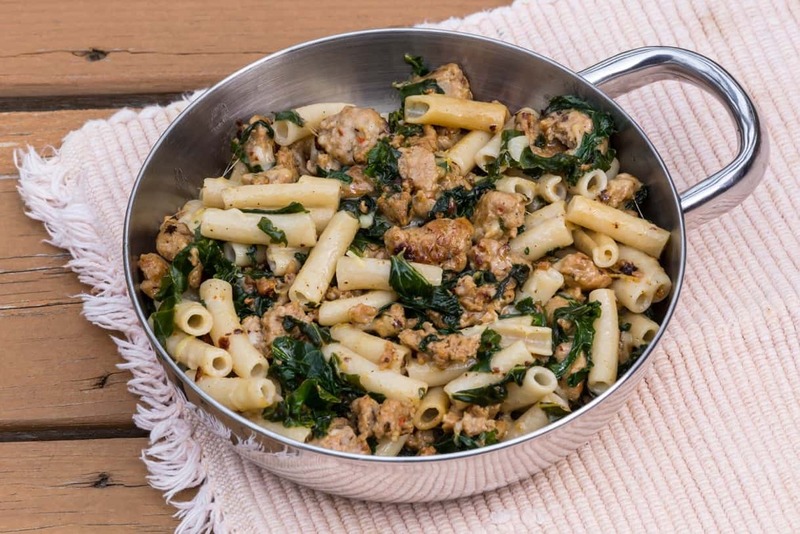 In this easy camping recipe, some of the stars of Italian wedding soup – spicy Italian sausage, nutty parmesan and nutritious kale are tossed together with some cooked penne for a filling, but not too heavy camping dinner. Put the pasta water on to boil when you start prepping the other ingredients, for less time spent in the camp kitchen. And take your butter out of the cooler in advance for faster melting when you add it to the dish. This recipe makes four very hearty portions, it could potentially serve six lighter appetites. A hearty, easy camping dinner. In 10" skillet, heat the olive oil over medium heat, then add the sausage, cooking until browned (about 10 minutes). Stir the kale into the pan with the sausage, cooking until well wilted (about 4-5 minutes). Add crushed red pepper, salt and pepper to the sausage mixture, stir to blend the seasonings throughout the mixture. Turn off the heat and cover the sausage mixture until the penne is ready. When the pasta is ready, scoop out about ½ cup of the pasta water, set aside. Drain the pasta, return to the pot with the butter and parmesan, stirring gently to melt the butter. Add the reserved pasta water, stirring gently. Fold the sausage mixture into the pasta, until well incorporated.